Get On Board Day is a new national awareness and advocacy day to generate awareness of, and increase support for, public transit. On Thursday, April 25, join the Sacramento Regional Transit District (SacRT) in celebrating National Get On Board Day by leaving the car behind and riding public transit. In celebration of National Get On Board day, SacRT is offering free rides on April 25 for riders with a free ride flyer. 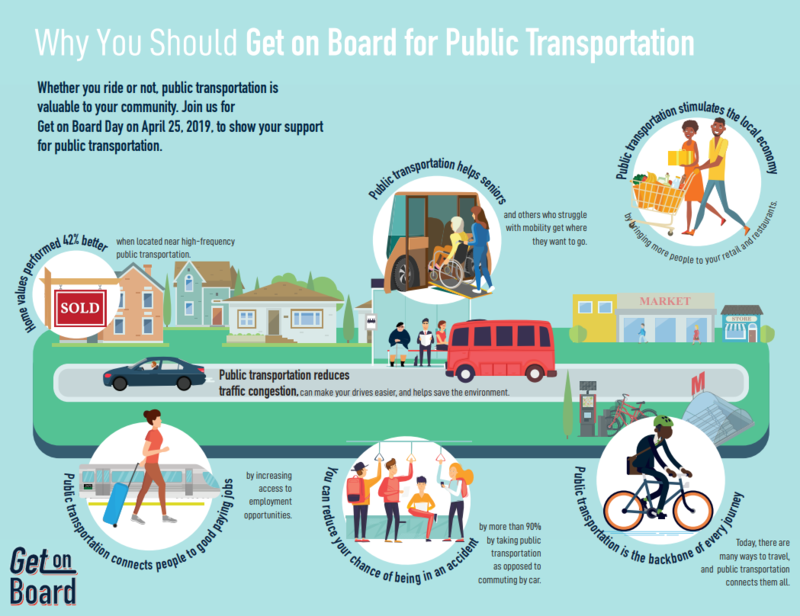 Sponsored by the American Public Transportation Association (APTA), the 2019 National Get On Board Day is a day that encourages people to support public transport and showcases the benefits it brings to communities. The average household spends 16 cents of every dollar on transportation, and 93% of that goes to buying, maintaining, and operating cars, the largest expenditure after housing. Home values in areas located near high-frequency public transit performed 42% better than other areas. Show your support for public transit and SacRT on Thursday, April 25 by riding light rail or bus. Take a picture and make sure to tag @ridesacrt and use the hashtag #GetOnBoard.